"The finest reference on combat vehicles in the Inner Sphere... The most comprehensive overview of field equipment and small arms ever published... A must for any small unit commander"
[b]Technical Readout 3026 (]Vehicles and Personal Equipment)[/b] describes the common, and not so common, pieces of military equipment used by the armed forces of the Inner Sphere. Included are detailed discussion of 40 combat vehicles, ranging from the Ferret Scout Helicopter and the Drillson Heavy Hovercraft, to the Schrek PPC Carrier and the Neptune Submarine. 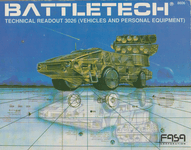 Dozens of pieces of individual equipment and small arms are also descibed, as are rules for their use in a [b]Mechwarrior[/b] or [b]BattleTech[/b] campaign. This volume is an invaluable aid to anyone interested in battlefield technology.